How exactly did so many of us come to be pouring a bizarre mixture of highly acidic phosphoric acid, addictive caffeine and disease promoting high fructose corn syrup down our throats each day? Aside from the many well-known health risks associated with drinking soda, just what kind of effect is this acidic beverage actually having on your digestive system? Could the way it interferes with proper digestion be a hidden cause of many common gastrointestinal disorders? While caffeine itself is a stomach and intestinal irritant that can cause premature gastric emptying, this page will cover the more damaging effects of soda’s two other main ingredients — phosphoric acid and high fructose corn syrup. Short of drinking undiluted vinegar, sodas like Coke and Pepsi are the most acidic beverage you can drink. Loaded with phosphoric acid, the pH level of a regular Coke has been measured at 2.5 and most other colas are close behind. In the way these the pH of liquids are ranked, a pH level of 2.5 is about 10,000 times stronger on the acidic scale than water. To get an idea of the strength of the acid in soda, water has a pH of 7 and your blood must remain between 7.35 and 7.45 pH for cellular processes to function properly. By comparison, battery acid, that will eat away your skin on contact, has a pH of 1. 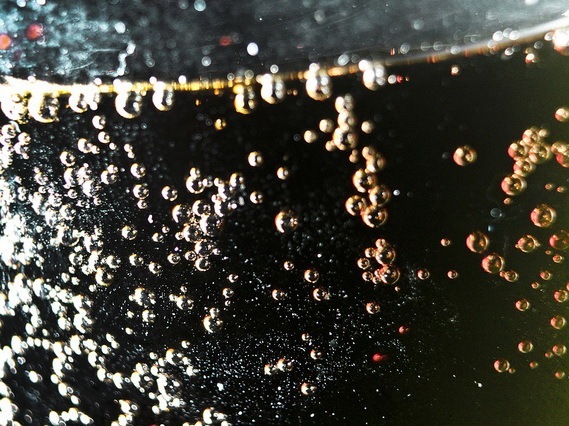 Soda, with its phosphoric acid, clearly has more in common with the later. White cleaning vinegar, that few people could drink without retching, has a pH 2.4. That just slightly more acidity than a regular Coke. There’s a reason why sodas don’t taste anywhere near as acidic as vinegar though — high fructose corn syrup. And not just a little of it either. Soda manufacturers need to really pack in this fattening and disease causing sugar to disguise the sheer acidity of the phosphoric acid. It would be completely undrinkable without it. Just how much sugar or high fructose corn syrup (HFCS) do manufacturers saturate soda with? Quite a bit by any measure. A can of regular cola has 39 grams of high fructose corn syrup. That’s around 10 teaspoons of added sugar. But does anyone drink just a small can of soda anymore? Many people buy the 20 ounce bottles and they contain a whopping 65 grams of sugar. That’s nearly 17 teaspoons of fattening and intestinal bacteria feeding HFCS per bottle. Imagine if you asked someone how many sugars they wanted in their tea or coffee and they asked for 17 teaspoons. You’d think they were mad! Yet this is what a lot of people are drinking with their lunch and dinner each day. Soda consumption is strongly linked to weight gain, diabetes, heart disease, arthritis, and many other serious health conditions. What’s less well known though are the digestive health costs of drinking it regularly. If you’re suffering from gastrointestinal issues, like bloating, stomach cramps, diarrhea, constipation, irritable bowel syndrome and excessive flatulence, then keep reading to understand how soda directly contributes to these problems. The high fructose corn syrup that sweetens most colas in America is a particularly damaging substance that causes health problems throughout your body. While some of the fructose from soda goes to your liver to be converted into triglycerides (belly fat), excessive amounts can also reach the lower intestine. Here it is a favorite food for bad bacteria, and they quickly ferment it into lots of intestinal gas. Some people are especially sensitive to this kind of sugar and experience fructose malabsorption symptoms like abdominal cramps and bloating soon after drinking soda, fruit juices and other high fructose sources. Virtually everyone will experience fructose malabsorption at high enough levels though, and it’s telling that around 70% of people with irritable bowel syndrome also have fructose intolerance. Regardless of whether you experience obvious symptoms, like belly bloat and intestinal contractions after drinking regular soda, if you have it regularly you’re almost certainly fueling bad bacteria growth. Your mouth, throat and particularly esophagus are all sensitive to phosphoric acid and can become irritated with regular exposure to acidic cola. What about your stomach though? Some people believe that because the hydrochloric acid in your stomach is of an even lower pH, the acidity of soft drinks should have no effect. Unfortunately it’s not that simple. Regularly drinking soda during meals can reduce beneficial gastric acid in your stomach, particularly as you get older. Cola’s phosphoric acid is itself a powerful acid and, while it doesn’t do the job of hydrochloric acid, it can make your stomach acidic enough to impair HCl production. To make matters worse, the excessive sugar in soda is also known to inhibit both hydrochloric acid and digestive enzyme secretion in your stomach. This is particularly a problem when you drink cola with a meal containing large amounts of protein. Your stomach produces hydrochloric acid primarily to sterilize and begin breaking down protein in your food. Protein that isn’t properly broken down here will not be further broken down and absorbed in the upper intestine. When this happens, undigested protein clogs up your lower intestine and it becomes a breeding ground for bad bacteria. They then putrefy it into toxic gases and compounds that can lead to many intestinal problems. Low hydrochloric acid in the gastric juices can also allow potentially dangerous parasites, yeasts and foreign bacteria in food to survive the stomach where they are normally neutralized. These parasites and pathogens are then free to move on to the intestines where they can take hold and end up causing all manner of long term health issues. There isn’t really a good time to drink soda, but clearly the worst time is with a big protein meal like a burger. Knowing what you know now, do you really want to super-size that? If you must drink soda then keep it as an occasional indulgence and have it well away from protein foods. The negative effects of this concentrated sugar and acid mix go far further and deeper than most people realize. However, if you value your health and would would like to heal your digestive tract for more energy and a lower risk of disease then here’s a simple way to make much healthier soda alternatives. I’ve also written a 10 step plan to quit soda here with a minimum of fuss that uses similar tasting replacements and deals with sugar cravings and caffeine withdrawal. If you’re a heavy cola drink it could well be the most important thing you ever do to improve your long term health.